What is typical in my home, while doing housekeeping? Broken glasses! Oh yes… even thought I am trying hardly to be really carefull, every time I do the dishes, something changes! Ok, it is not that usual for me to break glasses, but it really usual for my mom everytime she visits us. She tries to help me whenever this is possible, but I have told her, not to make the dishes… she never done with them without having at least two broken glasses or plates! The result? I don have a single set of plates or glasses complete…you know at least set of 6! At the beggining I was anxious about that, but then I decided to take it easy and now I like that there is no symmetry in my dinner’s tablea decoration. Actually this makes it even more personal… everyone has its own glass and plate, different from the one next to him (I am still trying to convince myself that this is fashion and not a huge issue!). Anyway… a few days ago an accident again happened and this time to my wine glasses. Now I own only two of them, that’s why i have decided to upcycle them to something different. Ombre Glass Candle Holders of course! 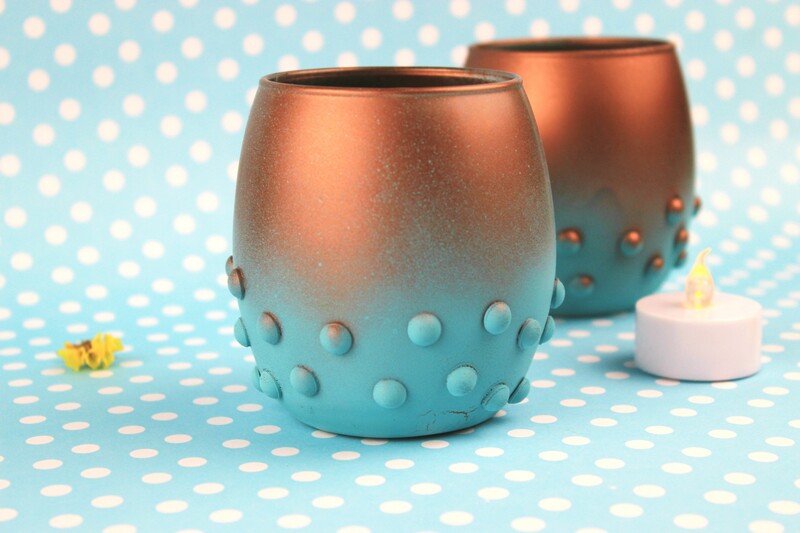 Of course it is really easy to just paint the glasses and have them only ombre. But for my home, I wanted also a small detail on them in order not to be that obvious that are wine glasses. 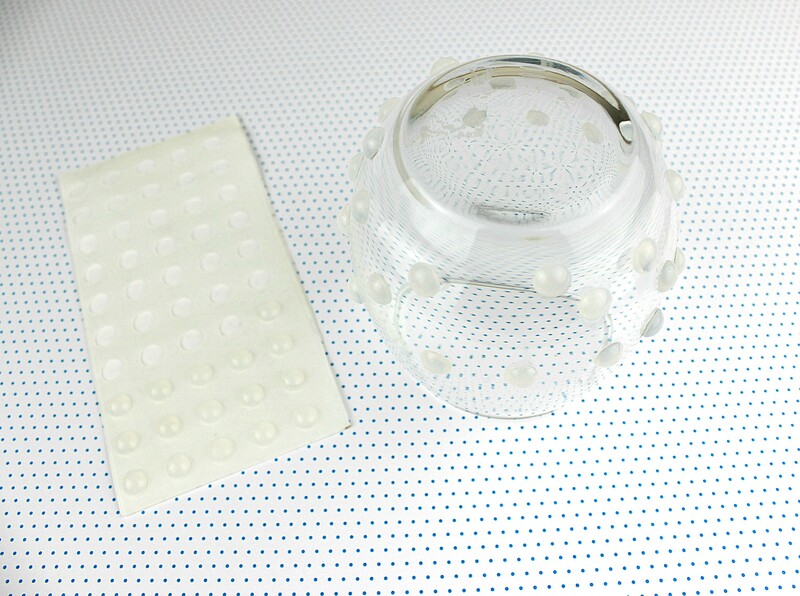 When I found these scrapbooking dots, they were amazing for my project. If you cannot find something similar, you can make your own by making small dots from hot glue on a baking paper and allow them to dry. Next step? use them to decorate the glass. I have put them in a no assymetry style in the base of the glass. Let’s start the funny part now. 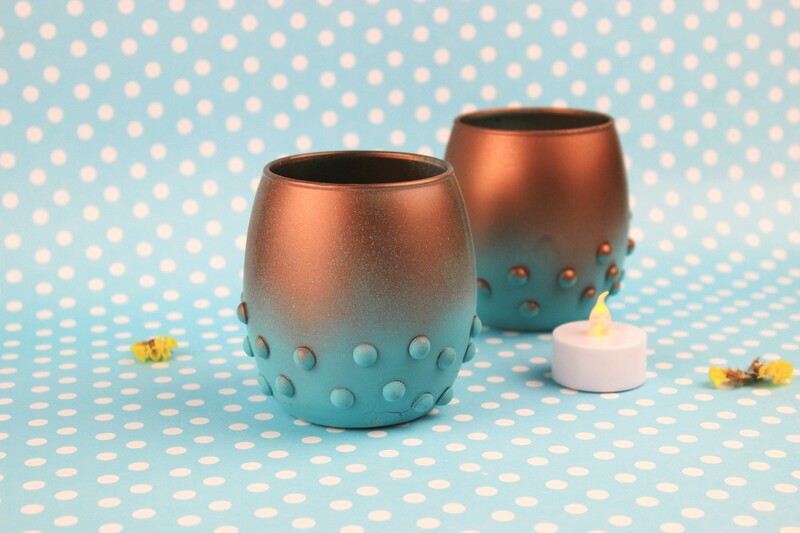 I always liked the ombre style (you know, the style that at least two colors are combined but without having sticked lines or limits) and these candles were the perfect way to try this techniq. So fist, start painting with the first color your glass and allow it to dry. Use the baking paper to put your glass on it, in order not to create such a huge mess. Next step, proceed with the second shade, teal blue for me. Put the glass upside down and start painting with the spray paint from a distance. Paint the base and then start moving your hand to paint from a greater distance. In that way we will have a beautiful ombre style. 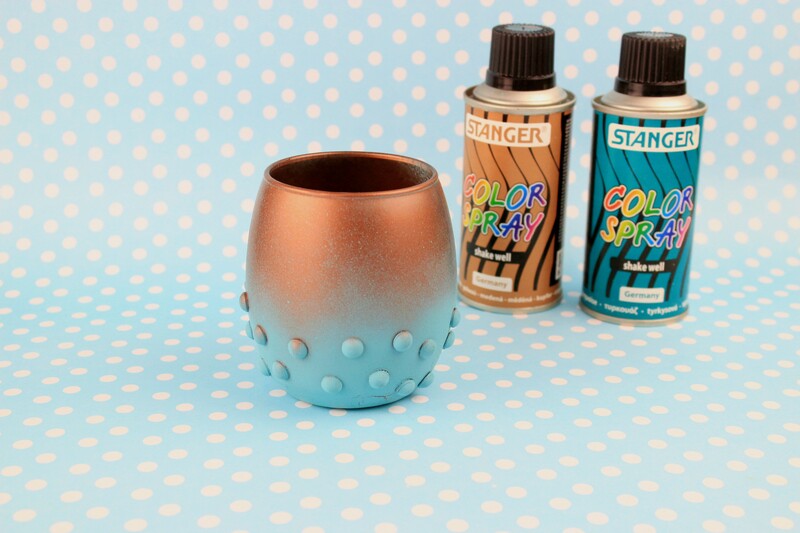 If there are also some paint splashes, no worry, it will make our ombre even more beautiful. Allow the paint to dry and the candles are ready. The paint on my candles actually made some cracks, so I have decided to paint it more. However after a second thought, I changed my mind. 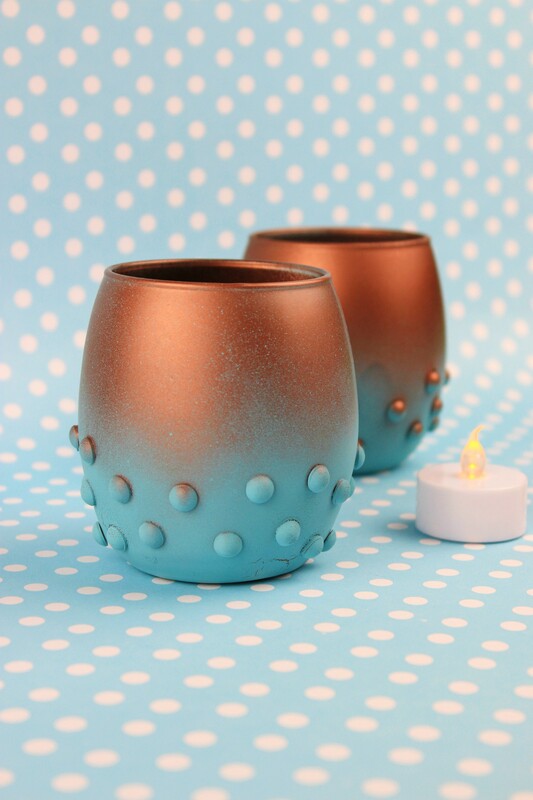 This crackled style makes the candles to look vintage and I actaully like it! The perfect recycle project. From wine glasses into ombre glass candle holders! 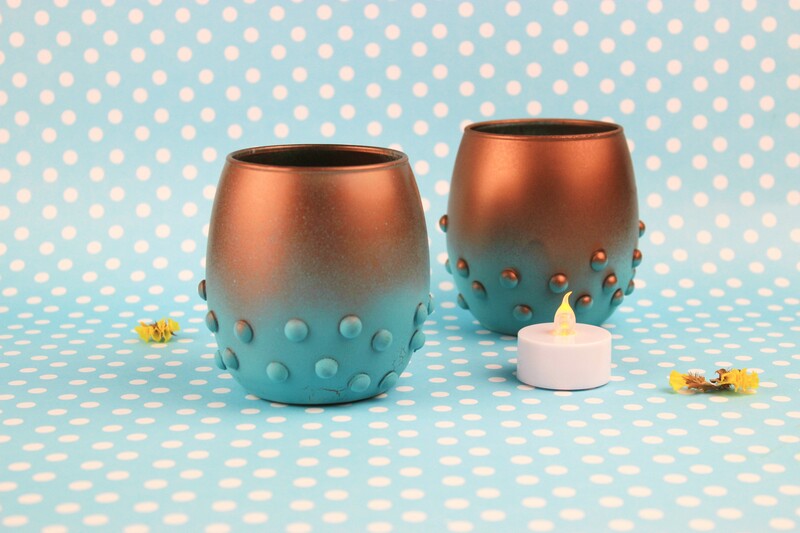 Put some tealights and enjoy them! The light of the candles is amazing, but if you want to have stronger light then use pastel colors on your glasses or even not paint them too many times in order to keep this transparency. Candle holders are ready but I wanted something next to them. That’s why I have also created a serving dish…but this is another post! But until then you can check out more decoration accessories diys here! So, have you ever used your glasses for your crafts?